A public forum on the preservation of artist environments is being convened on Thursday, July 10, 2014 in the Lubar Auditorium of the Milwaukee Art Museum, 700 North Museum Drive, Milwaukee, Wisconsin, from 7:15-9 pm. 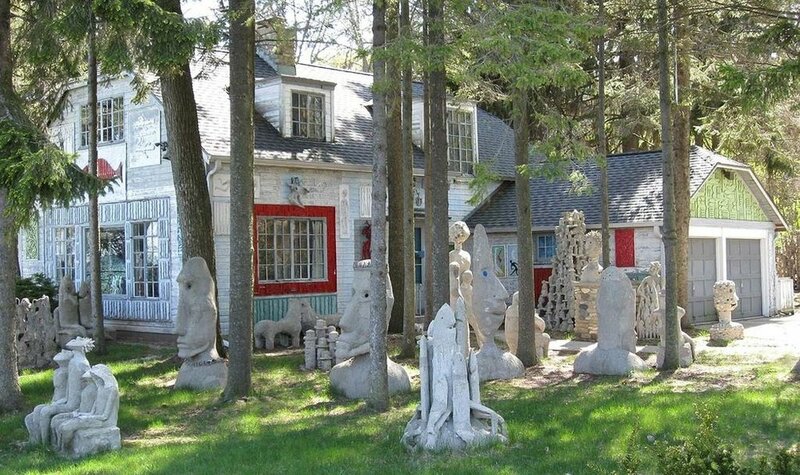 The forum was organized in response to the announcement that the John Michael Kohler Arts Center intends to move the environment of artist Mary Nohl, located on the shores of Lake Michigan in Fox Point, and a rare example of a vernacular environment created by a female artist, to a location in Sheboygan. The forum is free and open to the public. The central purpose of the Preservation Forum is to provide fuller public consideration of the issues surrounding the preservation of artist environments such as the Mary Nohl residence, particularly when they are located in communities that must balance the impact of allowing public access (even on a very limited basis) against the value of preserving a local cultural treasure. The Kohler Arts Center's announcement, which caught many by surprise, became the catalyst for a discussion of the ramifications of moving such a site. It is hoped that this event will not only expand public understanding of the particularities of the Nohl situation, but also introduce into the discourse a clearer sense of the recurring preservation issues that surround artist environments: negotiating with neighbors, defining public access, funding preservation, and weighing the impact of cultural loss on our sense of place. The program will be moderated by Polly Morris of the Public Art Subcommittee of the Milwaukee Arts Board and will begin with an introduction to the artist's work by Debra Brehmer of the Portrait Society Gallery. Speakers include Ruth DeYoung Kohler, director of the John Michael Kohler Arts Center; Lisa Stone, curator of the Roger Brown Study Collection and adjunct associate professor in the Department of Art History, Theory, and Criticism, both at the School of the Art Institute of Chicago; preservation architect Matthew Jarosz; and local historian John Gurda. Brehmer will take a brief look at the environment Mary Nohl built inside and outside her Beach Drive home over a period of more than forty years. Brehmer has a master's degree in Art History, and wrote her thesis on Mary Nohl. She is the owner and director of Portrait Society Gallery and teaches part time at the Milwaukee Institute of Art and Design. Following a brief introduction to the significance of vernacular environments in our cultural landscape and the imperative to preserve the best examples, Stone will present an overview of environments built by women––most of which are no longer extant––to position Mary Nohl's work within this context. Stone's research and teaching focus on the preservation and interpretation of artist’s environments and collections, and the relationship of objects to creative practice. Since the early 1980s she has worked on the documentation and preservation of environments by artist/builders whose works are home and garden-based, who ignore or dissolve boundaries between home and studio, life and art. She works with Don Howlett on preservation planning and project implementation for their company Preservation Services, Inc.
Matthew Thomas Jarosz, Associate Adjunct Professor in the School of Architecture and Urban Planning at the University of Wisconsin-Milwaukee, is best known for his architectural design work related to historic preservation. By combining his teaching and research with his involvement in community preservation projects, he has provided extensive opportunities for students to apply and expand academic learning. His private practice, JaroszLynch Architects, has offered students important hands-on education in the matter of professional preservation activities. Since the 1970s, historic preservation has grown from a value-added element--nice but not necessary--to a cornerstone of civic planning. There have been losses, certainly, but there is also a new and broadly shared awareness of the importance of the past in our present. What's too often missing in the preservation discussion is a concern for context. No landmark exists in a vacuum. Each is embedded and embodied in a particular landscape that is integral to comprehending its story and understanding its importance. Gurda will illustrate the general principle with examples from Milwaukee's built environment. Gurda is a Milwaukee-born writer and historian who has been studying his hometown since 1972. He is the author of nineteen books, including histories of Milwaukee-area neighborhoods, industries, and places of worship. The Making of Milwaukee is Gurda’s most ambitious effort. With 450 pages and more than 500 illustrations, it is the first full-length history of the community published since 1948. Milwaukee Public Television created an Emmy Award-winning documentary series based on the book in 2006. In addition to his work as an author, Gurda is a lecturer, tour guide, and local history columnist for the Milwaukee Journal Sentinel. He holds a B.A. in English from Boston College and an M.A. in Cultural Geography from the University of Wisconsin-Milwaukee. Gurda is an eight-time winner of the Wisconsin Historical Society’s Award of Merit. Ruth DeYoung Kohler, director of the John Michael Kohler Arts Center, will provide a deeper understanding of how the institution works to preserve artist environments, and the many elements that contributed to the board's decision to move the Mary Nohl Art Environment from its original location. Kohler has been director of the John Michael Kohler Arts Center since 1972.